It never ceases to amaze me how some people can be so prejudiced about the way you look and in particular about your hair style. It seems that people do in fact judge the book by its cover and if you don't fit in with the rest of the crowd you can expect different and sometimes even hostile treatment. Occasionally I go for something a bit different with my hair style and clothes; so I recently decided to be bit more radical than normal and opt for a mohican style haircut. I got the usual funny remarks about mid life crisis (maybe true in my case! ), BA Baracas, I ain't gettin' on no plane!, Jake from the Tweenies and all that kind of stuff. No problem, kinda funny and well I guess it goes with the territory really. That sad and unfortunate fact however, is that the older and more conservative folk seem to have a problem with this. They don't care for all that and seem to have some preconceived notion that you are thug about to go out and you are about to rob someone or break the law. You can see it in their eyes, the sideways looks and whispering. If they can, they'll make life difficult for you and in their way let you know that you're not welcome. Mohican hairstyle, long hair, short hair? I quite object to this kind of treatment. Just because you look different, it doesn't automatically follow that you are out to cause trouble. A mohican hairstyle, long hair, extremely short hair, it is all the same in that you're either in that minority or you're not and you blend in with Joe public. Why do some people have this attitude? We're not hurting anyone, and it doesn't change who we are inside. There are plenty of really sick, violent and downright nasty people in the world. The vast majority of them you may pass on the street and you wouldn't even give them a second glance. Is it... because they look normal? Sadly, Boblet is quite correct. I am amazed that a hairstyle choice in today's world can justify a whole TV programme. I have advised people to try to prevent the spread of nasty comments by "turning another cheek"
What is the matter with people like this ? As a retired hairdresser I realise that the styles will stay there for years, potentially influencing many people, whilst using a hat then setting it at a jaunty angle, will make it do wonders for minimising the risk of derision. Well I'm goth/metal/rocker. I don't dress the part to such an extent most of the time now though because I'm also a nursery-worker. I know it's a bit fashionable to be goth at the moment but it wasn't in the 80's and early 90's when I expressed myself through my goth/metal looks the most, and I remember the comments "It's not halloween now" etc etc. Oh very funny. 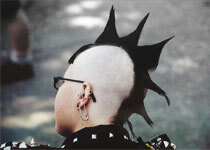 I love mohicans, I love the punk look (the genuine punks not the 'fashion' punks that appear in droves in baggy trousers and their pink t-shirts with the word 'punk' on them). But the fact is people will judge you. You have to remember that punks had a bad reputation in the 70's/80's. They are associated with drug-use, violence, rebellion... Yes this may be unfair but choosing to look a certain way you can only expect people to associate you with that reputation. I have been in pubs where punk is the norm. I felt safer there than in trendy pubs, they were lovely people. I suspect the punk reputation is unfair but it's there because some made their name by linking their punk look with antisocial behaviour. It is sad that people are ridiculed because of the way they express their personality through their looks, but even though it's wrong it is unfortunately to be expected. Not excused, but expected. The person who coined the phrase "Don’t judge a book by its cover" was a wrong. I used to drink in a pub called the Mill House. Doug the manager served the worst bitter in town his answer to complainants of his cloudy brew was, I quote. you are drinking with your eyes, and he was serious. Believe me a book is and always has been judged by its cover. Another down side is you will be missing out on some beautiful women. I got a mohican and I expect a funny look now n then, if it bothered me id shave it off. Why are you concerned about the looks they give you? You surely must be aware that wearing your hair in this way IS going to attract attention and controversy. This is EARTH - not Tatooine. If someone walked around with a plastic replica of a brontosaurus glued upside down on his head, I bet you'd be giving him some of the same looks you say YOU'RE getting. Now as for your do, you obviously don't want to "blend in" and of course that is your right - but - you know what they say: If you can't stand the heat, get out of the kitchen! I totally agree with you, and I'm 64. When I was a kid, people gave me strange looks because I had a Beatle's haircut. the hostility from your friends probably arose not through what they actually thought of it but from knowing that they were going to be stared at when they were out with you. No one likes being stared at and pointed out all the time. You lose your sense of privacy and anonymity. When I got my Mohawk, half my friends were alienated to the point of hostility) and half were cool, interesting social experiment on people who fear the unfamiliar. Why are people telling this Dude to shut up and he/she is a w*nker .. He/she has the right to their opinion on this subject. and people are now stero-typing people by the way they look or dress, its not right. even though we cant stop stero-typers. but people want to dress and be in one type its up to them, its THEIR life. so stop telling people not to be individual we dont all want to be boring dull people do we? ... So get over it ^.^ ..
why does someone have to grow up just because of their hair cut... why don't you grow up! same with me even my parents think differently to my hair style. Oh look, another idiot. I thought the schools had gone back already. Shouldn't you be playing with your lego bricks instead of fart arsing around on the Internet? Leave this stuff to the grownups and the older children. Yes to the fullest,spotting a mohican.I dont think there is any other hair sytle cooler,except for mr bentley..It brought a difference around..